Don’t expect the dems to hold back on adding cost to industry just because we won’t have any jobs. They are all lining up on their favorite religion, committees are in place and the leaders are all saying the same things. Here is an article I read yesterday. John Kerry promising to make this issue a priority. He then goes on with a bunch of double talk as though industrial cost somehow builds opportunity. Green jobs through higher cost services is a common falsehood which goes regularly unchallenged in the media. Costs do not create jobs, cost savings create jobs costs slow them down. you can’t back off what the science tells us must be done as a matter of global survival. And so you have to turn this challenge into the economic resurgence — into the economic rebound. Sure the green requirement will create new industries but the costs will quite clearly take from existing ones. It has the same effect as increased taxation. This has gone un-addressed in the media so it has become an obvious true thought in the public mind. But make no mistake, this is another form of load on energy costs, the same as if they raised taxes. We are going to charge ourselves money to find prosperity. Not that smart really. And I think that President Obama is poised to show America how a green economy and a transformational economy away from this dependency on fossil fuel is, in fact, part of the plan of restoring our economy and strengthening our economy. You can’t accept the science and say yes global climate change is manmade and yes global climate change is happening faster than the scientists, in fact, thought it was going to and then not accept the same scientific conclusions with respect to what that impact is and what we’re already witnessing; i.e., the melting of the ice cap, the rising of the ocean levels, the change in weather patterns, the change and migration of forests, the change in agriculture, the droughts. Right from the Hansen, Schmidt, Mann playbook. Warming is happening faster than scientists predicted, ice caps are melting, ocean levels are rising, changes in weather patterns. All of this is rubbish and has nothing to do with science. The northern ice cap has made such a swift recovery this year from it’s summer low that it exceed all previous records. Remember the fastest melt in history this august, well where are the fastest freeze in history articles? The big one is that temperatures have nearly stopped rising this century so far. There has been very little to no rise whatsoever according to the main temperature metrics. We were supposed to rise substantially yet it didn’t happen. The rest of Kerry’s list is more fraud than I can deal with right now. The ugly secret is that he and the rest of the democrats know that this issue is bogus. They know they are dramatically exaggerating the truth. What Americans need to ask themselves is — If they know, Why would the democrats do that? Make no mistake even with their buddies in the banking industry, they will happily sacrifice the economy for global warming. For those believers who read this article and think the economy doesn’t matter, just think how much more oil and coal we will burn if there is nobody to pay for the changes to higher cost energy? How many people will starve in poor countries due to higher food costs? What will we do when we cannot heat our homes in the winter? Will the democrats give us fuel credits? One other thing is for certain. You can bet the ever more liberal politicians will get what they want. I received an interesting link from Richard M part of his comment is below the rest is HERE. I believe there is some hope for one bio-feul … algae. It has significantly better output than does corn, soy, etc. There is a new tecnology currently being test marketed that uses a vertical arrangement to get more output. They claim 33,000 gals/acre/year. The great thing about comments on a small blog like mine is that I read each and every one. Along with my natural lack of political correctness I also am unafraid of being wrong. I do it quite often as my wife will happily tell you. Check out the link above, it is pretty interesting. 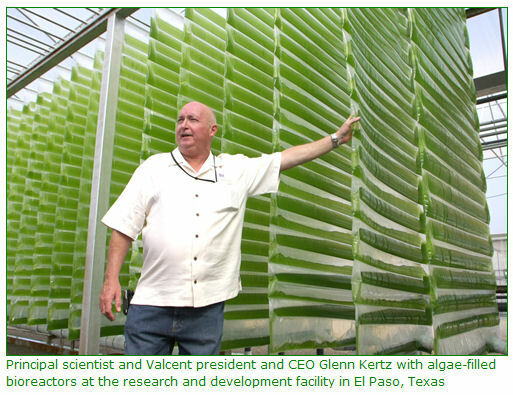 They claim 33,000 gallons per acre of vegetable oil created using a cool structure which stacks the algae in tubes. This is a huge claim considering that corn produces like 50 gallons per acre or something. Pond algae was the previous best at an inflated 900 gallons of oil per acre. Pretty exciting stuff if it’s true really. Well we know that bio is a form of solar. Typically there is a very low conversion rate for sunlight into the oil, a bunch of light energy is wasted and a bunch more is put into plant proteins and other things not related to the final product – oil. So the first thing I did was check on how much sunlight energy per acre we can count on. These are just estimates- back of the napkin calcs – but they will give us a smell test. Direct high noon sunlight is about 1000 Watts/m^2 on a clear day. 28,141,575,000,000 Watt-Sec/acre or — Joules per acre in proper units. How many Joules per acre are there in 33,000 gallons of vegetable oil. Well my 5 minute search didn’t reveal any value for algae veggie oil but it did reveal that wikipedia was using my guesstimated value of 1 gal veggie oil to 1 gal gasoline. They are both hydrocarbons after all. Ripping hydrogen off a carbon chain (oils are to my knowledge all carbon chain based) and combining with oxygen produces the nearly the same energy from nearly every oil type fuel. In college grad school I taught a fuels and lubes lab to keep shoes on my feet. Well gas is about 121,000,000 joules per gallon so we get 33,000*121,000,000 = 3,993,000,000,000 Joules per acre. This means that 3,993,000,000,000/28,141,575,000,000 * 100 =14.1% of the total sunlight is converted into oil. This is a huge number. Look at the system they used. The new US sentate has big plans for next year on fighting the emission of plant fertilizer. The first item is a new program with a budget equal to Nasa. A 15 Billion dollar bill to expand research into clean energy and Biofuels. For corn and soy a generous amount of biofuel per acre is 150 gallons of ethanol (you can find many sources on the internet). It takes considerable power to make corn and soy beans into gas. For some time there was a debate as to whether it took more fuel to make the ethanol than it produced. Today some report a reasonable number of 1.35 gallons of ethanol to 1 gallon of processing fuel. So we net .35 gallons/gallon actual. For 150 gallons we get 38.8 gallons of usable fuel per acre. If we assume 1 gallon of bio-fuel is equal to 1 gallon of gas (it’s not) but it is close. We need 390million gallons/day or 142.35 billion gallons per year. This requires 142.35billion/38.8 gallons/acre or 3.67 billion acres which equals 14.85 million square kilometers. Unfortunately the entire US is only 9.1 million square kilometers. This simple calculation should completely end the debate on biofuels but it doesn’t. Every honest engineer knows biofuels don’t work but what is worse are the subsidies from the federal government which have driven up fuel prices and created shortages across the poorest parts of the world. The inane policy of our government is actually killing people not to mention costing us money by increasing food prices and taxes. We have to cover the entire country nearly twice over with corn or soy just to power our cars that drive on the same land! The government knows this yet they pretend ignorance, it’s good for the people. Biofuels are a method for further socalizing farming, nothing else. Yet these cold people shamelessly push these policies which are currently causing starvation in the poorest countries in the world. All in the false name of climate change. The second policy is even more pointless. A cap and trade system will be set up by the EPA. This will do nothing except add unplanned cost to already existing industries which power our ever weakening economy, it won’t do a thing to stop people from heating their homes but it will cost them more. The unwanted side effect of these increased loads will be to slow technological innovation because the companies large enough to create these advances will have less money for funding them. Just what we need, more spending, higher taxes and more load on our economic system. It really burns me up to think that it’s all based on weak science funded by the same people making the rules. Just a silly post, sometimes it’s good to point out the extremist viewpoint just to see how far they have gone. I did a post on this site when they declared “conservatively” that we have 100 months until global warming doom well after Nov we will be at 97 so feel free to sell your stock and party like it’s 1999. The link is here but it is guaranteed to steal a couple of IQ points from you if you read it so be warned. Governments moved quickly to rescue our banks. Why does it take any longer to act to save the planet from runaway warming? This guy is so far gone that he advocates breaking the law to stop global warming of course he does it indirectly through our buddy Al Gore who’s up to his ears in money from his little global warming project. His comments followed the extraordinary emergence in the UK of case law that is beginning to legitimate previously illegal environmental direct action. I feel bad for our friends in England after reading this next quote. But at the trial, the jury refused to convict them after hearing expert witness evidence on the threat of climate change. They accepted the “lawful excuse” defence, which allows property to be damaged if it is done in the name of preventing damage to property elsewhere. Oue good English friends are much further along in accepting socialist enlightenment than those of us in the United States — but we were the riffraff when we moved out so they shouldn’t be surprised at our slowness. Comparing like with like (the data sources and methodology are continually being improved), this year the world ran into ecological debt on September 23, five days earlier than last year. They are much better than us naturalists at choosing buzzwords. Ecological debt has a nice ring to it don’t you think. There was an odd point made at the end of the article which really surprised me. With talk of new runways and coal-fired power stations, the government is engaged in the environmental equivalent of promoting unguaranteed sub-prime mortgages with no credit checks and telling banks with no assets to keep lending. Sure he’s talking about CO2 but he is comparing it to the US Democratic party policy of forcing banks to make loans to unqualified borrowers at subprime rates with preferential treatment for minorities. This was a democrat policy which Clinton bragged about and directly led to the recent crash in housing. The republicans had their chance to fix it but chose to accept contributions across the board (much smaller than the Dem’s) to ignore the situation. Make no mistake people we have been fleeced by both parties. Fleeced isn’t a strong enough word. The surprise is that this guy doesn’t realize he is biting the hand of the biggest $$$ supporter of his cause. Perhaps he needs to follow US politics more before he makes these claims. Well Andrew Simms proudly states that he happens to be on the board of greenpeace UK so what can you expect. I’m going to put a link on their blog to this article. $5 says it will be deleted. Update: Darn, comments are closed. I guess the reason for this post is simply because I can’t understand these people. There is no objectivity whatsoever. They are so convinced by their own dogma they become lost from reality. It’s a form of extremism I suppose. When it bleeds into court systems and is supported by Gore who is selfish enough to give them credibility for his own personal gain it becomes a bit frightening. Like Europe adopting Muslim law. It’s a bad dream where unreasonable positions are supported ahead of the reasonable. Just nuts. The change is beginning as promised. Being a conservative in America today is like being a Detroit Lions football fan, you start the work day with no hope and are surprised when you are wrong. Well no surprise today. A nice limo service driver explained to me last week on my return from the backside of the planet that we have to get behind our president and see what he can do. Well I was a bit tired and in a bad mood so I carefully explained my position –“The hell I do, I don’t like his policies, I don’t like his friends and associations and I don’t even like his wife.” Well it was a bit strong and a little funny, looking back but I had been traveling awake for 24 hours and wasn’t real happy so forgive me. The driver wasn’t offended and we spent most of the rest of the trip laughing about other things anyway. At least the Democrats know how to win, the allegedly conservative Republicans didn’t have a clue when Bush won and they gained marginal control of the houses. Instead of following up with their promises of cutting spending they just powered ahead spending more than ever. Make no mistake America has not yet tried conservative government even though we had voted for it. It’s good to be back. In China the internet is amazingly slow for any websites which might have political meaning due to intense censorship. The censors err on the side of caution. While I wasn’t blocked, after several ten minute logon times to my own blog I gave up posting. However, China’s multi-billion dollar internet censorship program allows my site but our left wing American blogs (Tamino or Real Climate) won’t allow on topic posts which dispute their claims – think about that one.